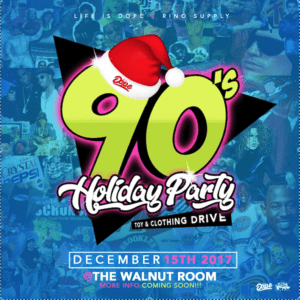 Rino Gives Back with a 90’s Holiday Party, December 15 at The Walnut Room. 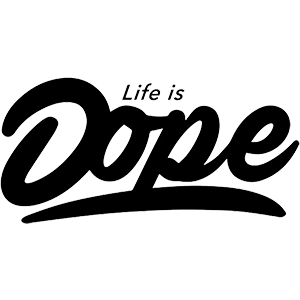 Rino Supply has joined forces with media partner Life is Dope to bring holiday cheer to their most valued asset, the community. Over the years Rino Supply has always localized events and sponsored local artists and businesses. The December 15th event at The Walnut Room focuses on local, but goes a step further. This year Rino Supply is sponsoring two Colorado non-profit organizations with a clothing, food & toy drive. The 100% donation-based event will feature 90’s themed music event. 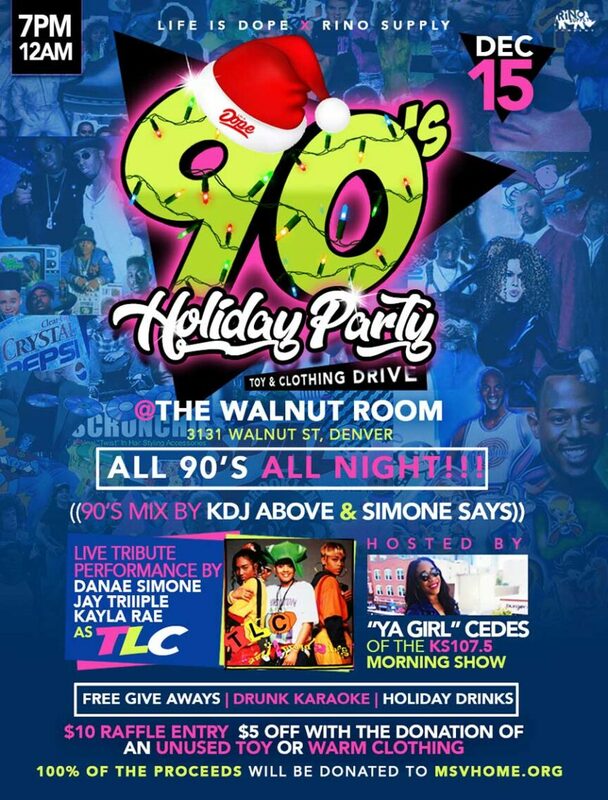 The Life is Dope: 90’s Holiday Party will be accepting canned food for Food Bank of the Rockies. All clothing, toy and financial proceeds from the event will be going to Mount Saint Vincent Home. The Life is Dope 90’s Holiday Party, sponsored by Rino Supply will be a night of celebration and and fun, but with purpose. While revelers will be getting footloose on the dance floor they will be doing so with heartfelt intention. Attendees who donate 1 canned food item, 1 wrapped toy OR a cold weather clothing item will receive $5 off the $10 ticket, the $5 donation will be go to MVSHome.org. 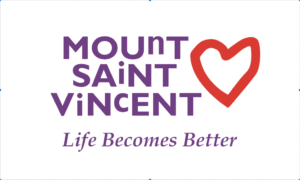 Mount Saint Vincent Home is one of the oldest and most important children’s homes in Colorado. While concert-goers will be getting down with Funky Cold Medina they will also be showered with holiday gift cards, door prizes, stage giveaways and raffle prizes. Get a ticket today and enter to win raffle prizes! The powerful presentation of talent from dj’s-to-hosts-to-supporting-brands are all curated by Life is Dope. The event donations will support neglected, abused or abandoned children at Mount Saint Vincent and assisting families through Food Bank of the Rockies. See how to donate and contribute to the event below! The seasoned General Manager of the medical marijuana facility continued, “You know, we are all very very fortunate to be working in Colorado and in this (cannabis) industry. With so much abundance it’s important to give back. Where I’m from that’s just what you do,” says Sweeney, a Colorado native. “We see all of this money being made in the cannabis industry but you never hear about organizations engaging in their immediate community or just giving back to the community that supports their companies. At Rino Supply we really pride ourselves on building relationships with patients. These people aren’t “customers”, they are our neighbors, and many have become our friends over the years. This holiday party is a moment we can celebrate with our family, friends and co-workers and provide an event that shows Rino Gives Back with a 90’s Holiday Party,” says Sweeney. Rino Supply has created #RINOGIVESBACK, a community engagement asset, which will be utilized with the 90’s Holiday Party and future endeavors. The company has created a brand identity for charitable donations and community support by using the “Rino Gives Back” moniker. 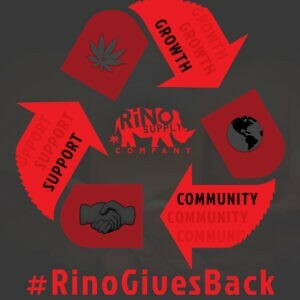 Follow Rino Supply social media for more information on #RINOGIVESBACK. In addition to the evening of celebration and charity, Rino Supply is teaming up with master curator Duncan Dash to design a fabulous holiday installation at Walnut Room, December 15. During the event, notable radio personalities will be hosting and offering door prizes. Individual and corporate sponsors will receive public “shout-outs” and digitally-projected recognition showing support for the Life is Dope: 90’s Holiday Party, sponsored by Rino Supply Company. There just might even be a Santa sighting with cheer for good grown-up girls and boys! Donate to the Rino Gives Back with a 90’s Holiday Party at Rino Supply. Tickets & donation stations will be available at 3100 Blake Street, Denver CO 80205. Monday – Saturday 9-6pm, Sunday 10-3pm and the night of the event. Allowable donations include: canned food item, unopened/wrapped toy, a cold weather clothing item. Additionally, tax write-offs are available for this event. Provide Rino Supply a receipt of your MSVHome donations prior to the night of the event. Contact Rino Supply Company directly regarding tax deductions and bulk donations. Check-out Rino Gives Back with a 90’s Holiday Party event page for event information. Click here to purchase tickets online thru The Walnut Room.